10’ Political Allegory, Paulo Alberton 2004, SBS. 2 Awards: Western Australian Screen Awards 2004 for Best Documentary and Best Editing. Christmas Island is a dot in the Indian Ocean, located 2600km north-west of Perth, Western Australia. Even though it is an Australian Territory, its closest neighbour is Java, 360km away. In this remote and paradisaical Australian island, there is an immigration detention centre. It became well known to Australians in 2001 when 450 refugees on a sinking boat were rescued by the Norwegian freighter “Tampa”. After rescuing the refugees, who were mainly from Afhanistan, the Norwegian captain headed to Christmas Island and the Australian Government refused the refugees permission to land and ordered the Tampa out of Australian waters. The captain declined to leave: pointing out that his vessel was not equipped to carry so many passengers. Prime Minister Howard responded by sending heavily armed SAS troops to occupy the ship. The film is narrated by the Brazilian Director who observes the everyday life of both multicultural dogs and people of the exclusive suburb of Cottesloe, in Western Australia. His humorous descriptions of these Australian cultural practices lead to the re-creation of a popular local event: a doggy Christmas party, organised by character Mrs. Ping Bond, a Chinese migrant. 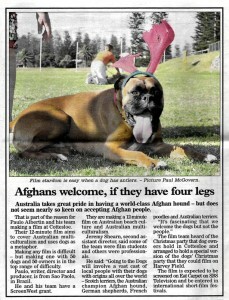 At the party the comparison between “multicultural dogs” and the asylum seekers of Christmas Island Detention Centre is unavoidable. Jul 2004 – Revelations International Film Festival, Australia. Oct 2004 – Perth Pride Film Festival, Australia. 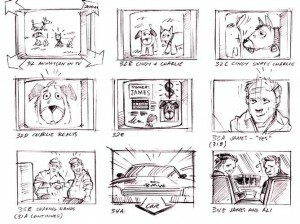 Paulo Alberton’s ten minute animated documentary film uses dogs as a metaphor to question the immigration policies of the Howard Government. Inspiring and imaginative, Alberton’s film is a moving example of the power of metaphor and poetic symbolism of the visual form. The filmmaker explores a sensitive political issue seemingly preoccupied by the history of dogs, yet, his ostensibly benign exploration of this topic quickly transforms into a stinging criticism of the government’s policy of mandatory detention. Senior Media students could benefit from viewing this film as part of their discovery of the short form and preparing for their major project. They could also learn a lot about the practical considerations; filming, use of archival material and, in particular, editing and the use of voice over, in effectively conveying a political message. The idea for this film originated whilst I was waiting for my Australian Permanent Residence Visa to be processed. After a relationship breakdown, I moved to the wealthy beach suburb of Cottesloe and met this Brazilian woman, her anaesthetist husband and her Chow-Chow dog. I started visiting their trendy social environments and on a number of times I went to walk her dog with her at the Cottesloe Oval. I then met all these other dogs, their owners and learned about the intrigues and stories of the Oval. As I spoke to the owners I noticed that most of them were migrants from various different countries; and so were their dogs. The world for me was all about immigration processes and their principals. I asked myself questions like: why can these dogs and these people be here and the Tampa Afghanis refugees can’t? I was also raising issues of cultural identity. When I met the visitors of the Cottesloe Oval Inoticed that they were not really connected to their original culture; neither were their dogs. Chinese people were not Buddhists and Blue Healers didn’t herd sheep. But they share one common new culture: the dog culture and the social status it provides. They even set up a Christmas party for the dogs every year. 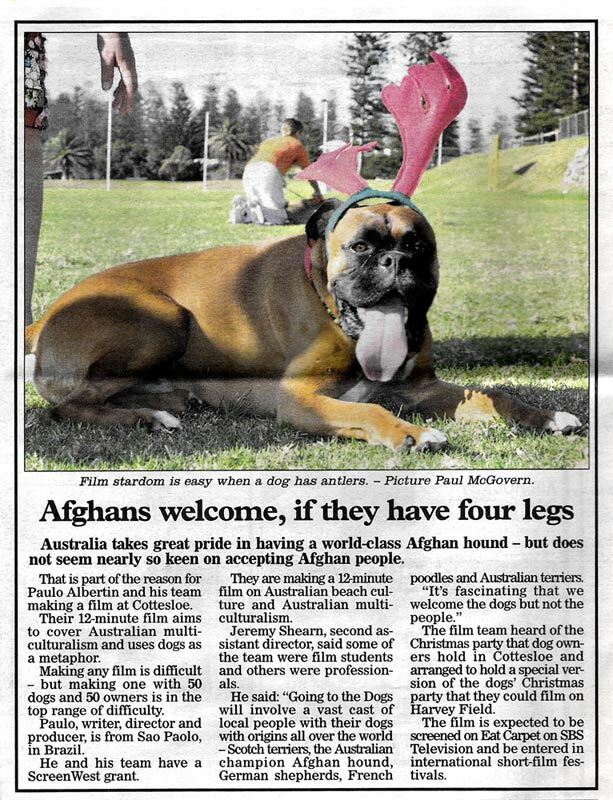 This “multicultural dog” Christmas party trigged another interesting question: is a country called multicultural simply because it is highly composed of migrants. All those thoughts were very present in my mind during the six months it took for my permanent visa to be processed. There are two important elements that drive the narrative: My reading and probing of my social environment in Cottesloe and my need to understand some values used by immigration laws in Australia. In the film I frequently type keywords on screen as if I needed to consult the dictionary in an attempt to understand this particular social environment and its values. The dogs’ issues and values cross paths with those lived by human beings. Sometimes the connection is obvious, other times it is subtle. The multi-layered brainstorm intends to reach people in different ways and depths. Some roles are played by actors, others by real people who perform stylised lifestyles, similar to their own. Visually the film looks like a brainstorm fast pace with a few short pauses. The cartoon-animated portion of the film is composed of real and designed elements. For example: people have real faces and designed bodies, in a caricature style and proportion. Animation is used to allow the descriptions of this social environment to be spicier and the connection between peoples and dogs to be humorous. The film experiments with the documentary and fiction forms.